No sooner had the Archbishop of Dublin announced that next year's Papal visit would cost somewhere in the region of €20m than the carping began. How could a short trip to Ireland by one man cost so much? Couldn't he fly in on Ryanair and find a room through Airbnb, like everybody else? Why not spend the money on more important things? Listeners to The Ray D'Arcy Show on RTE Radio One kicked off the bellyaching. Soon social media was in full swing. It does raise a sardonic eyebrow that a Pontiff named after St Francis, an advocate of radical poverty, should now sit at the head of such a conspicuously wealthy organisation. Most of the complainants were so sour, however, one would have sworn their festive cinnamon lattes had been spiked with vinegar. A misunderstanding about where the money is coming from may have sparked some protests. Many people assumed that taxpayers would be forced to foot the whole bill, and reacted accordingly. In fact, the Catholic Church itself is stumping up €5m, as well as raising more through collections and donations. There will be some cost to the State, but it will be nowhere near the total figure of €20m; and why shouldn't the State pay something anyway? The Pope is not merely a religious leader, but a head of State. It costs money when those people pop by. Security doesn't come cheap, and it's basic good manners to make an effort not to let your guests be killed when they're staying over at your place. One would hope other countries return the compliment when our President or Taoiseach come a-calling. The Irish Government also has a duty to safeguard its citizens from anyone who might want to make a name for themselves by attacking the Pope and doesn't care who gets hurt in the process. It's churlish to complain that there's a price tag attached to this obligation. Such meanness is worthy of Scrooge. The Church could, arguably, charge for tickets, and perhaps even turn a profit on the Irish leg of the Pope's ongoing world tour, what with all the merchandising opportunities it's bound to bring; but as Archbishop Diarmuid Martin told Today With Sean O'Rourke last week: "We are very anxious that people and families can come without them experiencing financial difficulties. We won't charge any admission to anything for children, (and) the Mass in Phoenix Park will have public access." Exactly the same as when the Queen or Barack Obama visited these shores, in other words. The royal and presidential visits in 2011 cost the State the not inconsiderable sum of €36m, and this was at the height of the recession. That included a €15m bill for Garda manpower alone. Mad, but no one uttered a peep of protest. Well, some disgruntled whingers with too much time on their hands did, but no one took any notice of them, and rightly so. Ignoring them is what we should also be doing to those moaning about Pope Francis's visit next year. It's not an exact comparison, because the Queen and Obama were here on official visits, having been invited by the State. The Pope's invitation came from the Irish Church. But this is nitpicking for the sake of it. Do we really hate Catholics so much that we must even begrudge them the pleasure and consolation of a visit from the Pope? It's been nearly 40 years since the last one in 1979. It might not feel like it, but it is. It may be decades again until the next one. His Holiness will only be here for a few days next August. He'll attend the World Meeting of Families; visit some prisoners, maybe a Traveller community; say Mass in the Phoenix Park; do his bit for the peace process by meeting the Queen up in the North on one of the days; then go home again. Where's the harm, especially in a country which, given a free choice in the census, still describes itself as 84pc Catholic? There are, of course, questions to be asked about the hierarchy's success in wriggling out of full financial responsibility for various abuse scandals. The Church got away far too lightly. But not insisting that religious institutions pay more was a political failure. Blame the Government at the time, rather than punishing ordinary Catholics who are simply looking forward to next summer's Papal visit. The money's just a convenient excuse for raising objections to Pope Francis's presence in Ireland, anyway. The truth is some wouldn't want him here under any circumstances. That quickly became obvious when aggressive secularists last week suddenly started demanding why that €20m wasn't being spent on the homeless instead. It goes without saying that people have a right to secure shelter, and the fact that 3,000 children will be without a permanent place to live this Christmas is an outrage; but similar comments could be made about many other examples of unnecessary spending. Why do we waste a fortune each year hanging festive lights in town centres? Isn't that also an insult to the homeless sleeping rough in shop doorways? See? Once you start this game of moral one-upmanship, it can easily backfire. Earlier this month, it was actually estimated that Irish households will spend an average of €2,654 on Christmas, an increase of merely three per cent on last year. Total cost: €4.5bn. And Christmas comes just a few short weeks after Black Friday and Cyber Monday, when consumers also threw caution to the wind, splashing out on smartphones, TVs, tablets and video game consoles to replace the ones they already had. Total online shopping alone is set to hit €16bn by year's end, according to Retail Ireland, a 50pc increase since 2015. The boom is back with a vengeance in some circles, and it's not only humans who are reaping the benefits. One report last week revealed that some people are spending over €100 on their pets, even buying Christmas-scented cat litter and Rudolph jumpers. Meanwhile, 40pc of people surveyed admit that they buy too much food during the festive season. What about demanding that everyone buy a bit less over-priced tat that they don't really need, and donate the money to the homeless instead, rather than making ourselves feel virtuous by giving out about the Church? Sounding off about other people's failings is easy. Actually doing something ourselves is harder. The 2016 census found that there were 4,952,473 people living in Ireland. If every one of working age gave a tenner to the homeless, that would already exceed the amount being raised to host Pope Francis, while still being dwarfed by the billions we spend on ourselves. It's not as if Christmas would cease to be enjoyable if we all spent slightly less money. Naturally, it's more complicated than that, because buying all this rubbish drives growth and creates jobs, but why let facts get in the way of whipping up a moral frenzy? Those attacking the cost of the Papal visit certainly haven't. They choose to forget the money that will be generated for the economy by hundreds of thousands of people descending on Dublin for one of the biggest events of the year. The bigger question is what happened to the media love affair with the 81-year-old Pontiff. 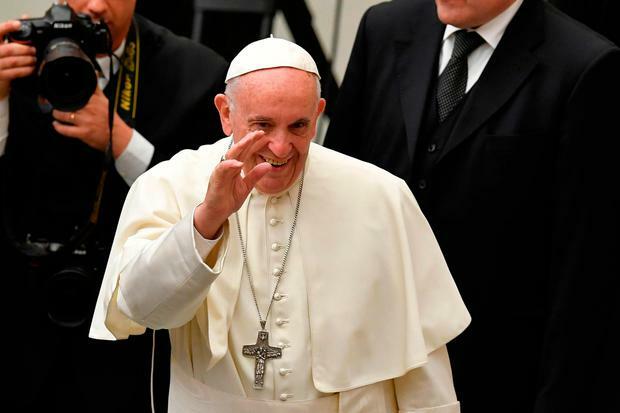 On his election in 2013, Jorge Mario Bergoglio was greeted as if he was Che Guevara in a little white hat, because he made all the right noises about social justice, and didn't seem overly keen on capitalism. He still doesn't, but he also upheld traditional teaching on abortion, homosexuality and female ordination, so the shine wore off. Basically, self-styled progressives went off him when they discovered that - shock, horror - Pope Francis (left) is a Catholic. Imagine the astonishment when they finally find out what bears do in the woods.